This website is operated by Mechs Direct UK. Throughout the site, the terms “we”, “us” and “our” refer to Mechs Direct UK. 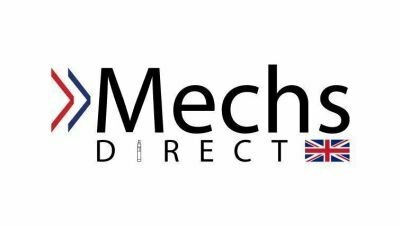 Mechs Direct UK offers this website, including all information, tools and services available from this site to you, the user, conditioned upon your acceptance of all terms, conditions, policies and notices stated here. We have made every effort to display as accurately as possible the colours and images of our products on our website. We cannot guarantee that your computer monitor/ phone screen of any color will be accurate. By Purchasing any of our products, you agree that you are over the age of 18 and agree to be knowledgeable of ohms law, battery safety and have a general understanding of mechanical mods and mechanical mod safety. Due to the nature of our products, we do not offer any kind of warranty on any of our products. Most of our items are tested before sale, this is done to minimize risk of any issues occurring. If however in the extremely unlikely event you receive a product that you believe to be faulty, please use the 'contact us' form or request a callback within 48 hours of receiving the item. If we are contacted after 48 hours, we will try our best to rectify any issues however we reserve the right to refuse to offer a refund/ replacement if we believe the issue to have been caused through misuse, negligence or otherwise user error. By purchasing any of our products, you agree that we cannot be held liable if an accident occurs through irresponsible user error. All of our items are brand new 1:1 styled products unless stated otherwise. If you believe your item has been lost in the post, please allow 10 working days for it to arrive as per Royal Mail's T&C's. If after 10 working days it still hasn't arrived then please contact us within 48 hours by email and we will investigate. If you contact us after 48 hours, we will try to rectify any issues however we reserve the right to refuse to offer a replacement/ refund if we believe the time frame to be excessive. All images on this website are the property of Mechs Direct UK. You do not have permission to use these on other websites or selling channels unless you have been given written consent from Mechs Direct UK.